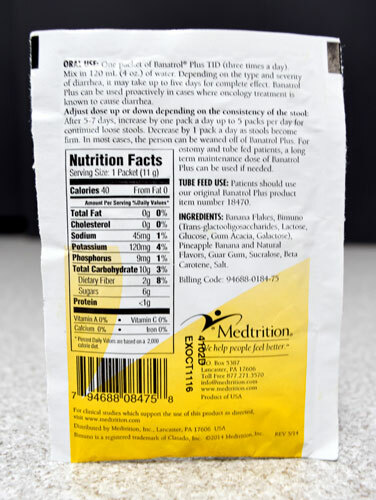 Banatrol Plus is a product from Medtrition that uses banana flakes and prebiotics to harden stool and create a healthy gut. Now available in Pineapple Banana! Prebiotics are fiber-compounds that populate the large bowel with bacteria and fungi that are good for digestive health. Prebiotics affect the body’s mineral absorption, immune system effectiveness, bowel pH, and intestinal regularity. Banana flakes have been shown to be a cost-effective treatment for Diarrhea. 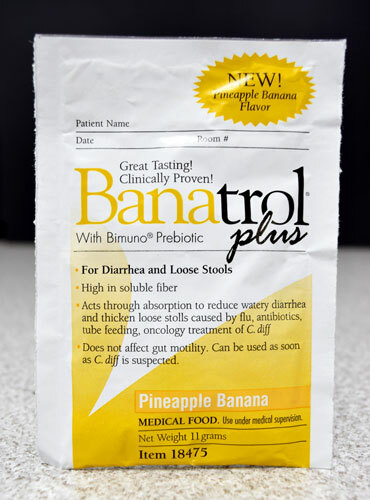 This study concluded that banana flakes were effective at treating diarrhea “despite a threefold increase in the number of patients testing positive for Clostridium difficile.” The banana flakes and prebiotics in Banatrol Plus create a powerful adversary to diarrhea. Taking Banatrol Plus is easy! Just mix a packet in 4 oz of water and take 3-5 times daily. It can take up to 5 days to work. It will not cause constipation, so it can be used as soon as C difficile is suspected. Banatrol Plus is for the dietary management of diarrhea caused by infectious disease and flu, antibiotic induced diarrhea, C difficile, tube feeding associated diarrhea and chemotherapy induced diarrhea.